Crown Laboratories, Inc. has acquired North American distribution rights of five OTC consumer brands from GlaxoSmithKline (GSK). The acquired portfolio includes: PanOxyl daily acne wash, Sarna anti-itch lotion, Zeasorb anti-fungal and prevention product, Desenex anti-fungal powder for athlete's foot, and Mineral Ice pain-relieving gel. The brands all have a strong heritage and lengthy history in the market. PanOxyl, Sarna, and Zeasorb are three former Stiefel Laboratories brands that have earned #1 Dermatologist Recommended status through decades of strong support from dermatologists. Crown Laboratories has chosen the Emerson Group to manage the sales activity and all logistics for the PanOxyl, Sarna, Zeasorb, Desenex, and Mineral Ice brands across all retailers. 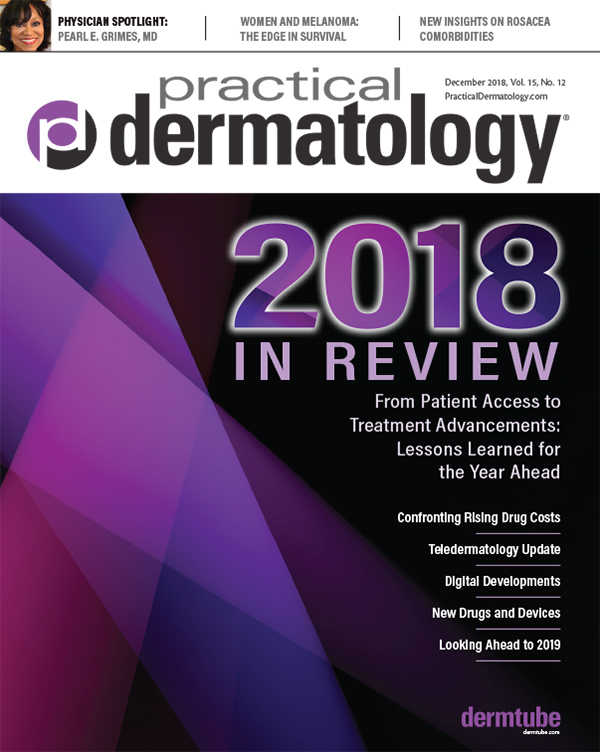 A Phase 2, open-label study published in SKIN The Journal of Cutaneous Medicine, found that subjects treated with Impoyz (clobetasol propionate) Cream, 0.025% showed significantly lower mean post-treatment clobetasol propionate plasma concentrations versus the subjects treated with Temovate (clobetasol propionate) Cream, 0.05% (56.3 vs 152.5 pg/mL). Both treatment groups evidenced similar improvements in global psoriasis severity as measured by improvements in the Investigator's Global Assessment (IGA) from baseline to Day 15. As a result, this data suggests that, compared with traditional-dose formulations of clobetasol propionate (0.05%), Impoyz Cream may provide a better safety profile without compromising efficacy. The article is available online. Additionally, a lower proportion of subjects in the Impoyz Cream group (12.5%) experienced HPA axis suppression compared to those in the Temovate Cream group (36.4%), although this did not reach statistical significance. Aclaris Therapeutics, Inc. has entered into a definitive asset purchase agreement with Allergan Sales, LLC to acquire worldwide rights to Rhofade (oxymetazoline hydrochloride) cream, 1% and additional intellectual property. The acquisition includes an exclusive license to certain intellectual property for Rhofade, which is approved for the topical treatment of persistent facial erythema associated with rosacea in adults. This transaction, which is subject to customary closing conditions, including certain governmental regulatory clearances, is expected to close in the fourth quarter of 2018. Allergan has agreed to provide support to Aclaris to allow for a smooth transition of Rhofade. Under the terms of the agreement, the purchase price includes an upfront cash payment of $65 million due at closing, a development milestone payment related to the potential development of an additional dermatology product, and tiered royalties on net sales. Allergan developed and brought Rhofade to market in 2017 after acquiring the drug as part of its 2011 acquisition of Vicept Therapeutics, Inc., a company established by certain members of the current senior management team of Aclaris. Candela teamed up with New York City dermatologist Roy Geronemus, MD and the Vascular Birthmark Foundation (VBF) to provide 40 free laser treatments to families with all types of vascular birthmarks and anomalies, including one very special patient. Every year, the VBF conference offers services and education to those in need. This year, the conference had more than 100 families register and none was turned away. Christian, who is 16 months old and lives with his mom Marjorie in Utah, has a port wine stain on the right side of his face. After learning about VBF and the conference, and especially that Dr. Geronemus would not be using general anesthesia, Marjorie booked their flights to the conference. While they lovingly refer to Christian's port wine stain as his “superhero dot,” Marjorie still feels helpless and saddened from time-to-time by the reactions her son receives from strangers. After learning about the offerings from VBF and Candela, she says she finally felt a sense of hope. Both mother and son attended the VBF conference for the very first time this year (though Christian has received 16 laser treatments to date), where he was able to receive a free Vbeam treatment. Through the conference, Marjorie was able to find support on Facebook and meet other parents experiencing similar worries, concerns, and thoughts about their children. She also met a doctor at the conference who will be continuing Christian's treatment in Los Angeles. Marjorie plans on taking Christian back to the VBF conference in a few years so that he can meet other kids like him. 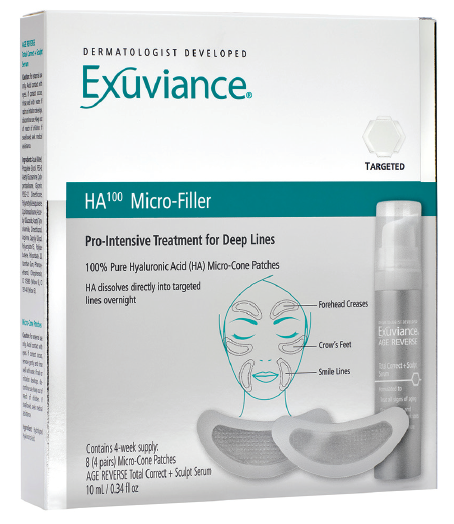 Exuviance is launching HA100Micro-Filler Regimen, a two-step beauty regimen featuring new Micro-Cone Patches that delivers 100 percent pure hyaluronic acid overnight. Exuviance HA100 Micro-Filler Regimen consists of Age Reverse Total Correct and Sculpt Serum with patented Aminofil, patented NeoGlucosamine and Vitamin C as well as the once-weekly Micro-Cone Patches. These micro-cones dissolve into skin overnight, plumping the look of lines with surface hydration. The Age Reverse Total Correct + Sculpt Serum addresses the signs of aging including dark spots, sagging skin and uneven texture. The serum is used morning and night, with the addition of the HA100 Micro-Filler Patches once a week at bedtime. In a consumer perception survey of 34 women who used Exuviance HA100 Micro-Filler Regimen for four weeks, 97 percent of women reported that their skin is more hydrated and plumper-looking where patches were applied and smoother looking. Ninety-four percent of women noticed fine lines/wrinkles were less noticeable and crow's feet lines were less noticeable overall where patches were applied firmer-looking skin. MDsave is partnering with CareCredit to bring easy healthcare financing to their mission of providing better cost transparency to patients. As consumers face ever increasing healthcare costs, CareCredit, a Synchrony solution, offers patients the ability to pay over time for deductibles, co-pays, co-insurance and other out-of-pocket healthcare costs. Providers receive guaranteed payment within two business days with no recourse to the practice if the patient delays or defaults on payment. Helping to reduce the billing related constraints on administrative schedules, CareCredit can free up valuable time to allow providers and their staff to focus more on providing high-quality care and a positive patient experience. MDsave launched in 2012 to help provide better and more affordable healthcare to consumers by allowing patients to shop, buy, and compare medical services through its platform. According to a Physicians Foundation Report, cited by MDsave, 67 percent of consumers surveyed said they or someone in their household are concerned about being able to pay their medical bill. A lipid that helps keep skin cell turnover on track may help restore healthy turnover in psoriasis, investigators say. Topical application of the lipid phosphatidylglycerol, or PG, on a mouse model of psoriasis reduced inflammation as well as characteristic raised skin lesions, they report in the Journal of Investigative Dermatology. They had already shown that PG has a role in both regulating the function of keratinocytes and suppressing skin inflammation. Now they have the first evidence that PG inhibits toll-like receptor activation by the antimicrobial peptides produced by those skin cells, says Dr. Wendy B. Bollag, cell physiologist in the Department of Physiology at the Medical College of Georgia at Augusta University. Toll-like receptors detect external invaders as well as internal damage signals then activate an immune response. The skin and a variety of skin cell types make antimicrobial peptides that function like an endogenous antibiotic to help the skin protect us, she notes. Psoriasis upsets the works by increasing the production of skin cells and production of antimicrobials by those cells. In some patients a problematic immune system may initiates the vicious cycle of skin cells producing proteins called cytokines that call in more immune cells that make more cytokines that cause skin cells to make even more cytokines and excessively proliferate, says Dr. Bollag. In others, the antimicrobials may initiate the vicious cycle. Either way, more antimicrobials get produced, which is probably beneficial, since psoriasis also impairs the skin's ability to prevent invaders. But these high levels of antimicrobials also produce an inflammatory response much like an invader's might, resulting in the red, flaky patches that typically surface on high-touch areas like the elbows, forearms and knees and also show up on the scalp and elsewhere, says Dr. Bollag, the study's corresponding author. Because at higher levels, the body sees these protective antimicrobial peptides as danger-associated molecular patterns, or DAMPS, which, as the name indicates, it views as signs of danger. DAMPS then activate toll-like receptors. It's the increased and chronic level in psoriasis that heightens the awareness and response, says first author Dr. Vivek Choudhary, molecular biologist and physiologist in the MCG Department of Physiology. Once toll-like receptors get activated, the immune system makes proinflammatory cytokines that bring in T cells, which help drive the immune system attacks. In the continuing vicious cycle, all the immune action prompts the skin cells to actually make more antimicrobials in response to the perceived danger. “It's a natural system that has kind of gone haywire,” she says. The investigators used S100A9 as their representative antimicrobial. In psoriasis, the levels of S100A9 correlate with the severity of the disease and, when treatment works, blood levels of S100A9 decrease. They found that both in keratinocytes as well as inflammation-promoting immune cells called macrophages, PG suppressed activation of toll-like receptors by DAMPS, in this case S100A9. This is particularly important in body areas regularly exposed to the elements like the skin, lungs, and gastrointestinal tract, she says. Maybe part of the problem with psoriasis is that this fine control no longer works well, she says. Inflammation in the absence of an infection is a hallmark of psoriasis. The resulting inflammation produces a “feed forward” response: Keratinocytes start to excessively proliferate and abnormally differentiate and the skin thickens. PG enables the normal differentiation of new skin cells as cells make their way up multiple layers, reach the surface and old cells slough off. PG is made from glycerin, a natural alcohol, water attractor and key component of many lipids, which helps skin look better and aids this healthy production and maturation of high-turnover skin cells. Glycerin is transported by aquaporin-3, which the MCG investigators believe is decreased in psoriasis versus healthy skin. While there is a variety of topical treatments for psoriasis, including vitamin D analogues and glucocorticoids, nothing is reliably effective for all patients, Dr. Bollag says. Part of the problem likely is that the causes of psoriasis vary and they are mostly not understood. Systemic drugs also are given that generally suppress the immune response, which have obvious side effects like leaving patients susceptible to infection and cancer. Dr. Bollag explains that she doesn't think PG will be a magic bullet, either, but may one day be a good option for patients with mild disease or as an adjunct to other therapies. PG is also a component of surfactant, which enables the airs sacs in the lungs to properly inflate to allow breathing. It's been shown to inhibit inflammation in the lungs induced by microorganisms and that its function there may also be regulated through toll-like receptors. Dr. Bollag notes these new findings about what happens in the skin are likely applicable to similar conditions, where this so-called “sterile inflammation” occurs in response to substances naturally found in the body. Research support includes funding from the National Institutes of Health and a US Department of Veterans Affairs Research Career Scientist Award. MCG medical students Hiral Patel, Elyssa Cohen and Wendi Bao are study coauthors. The American Dermatological Association is co-sponsoring the American Cancer Society's public policy of vaccination against Human Papillomavirus infections (HPV) beginning at age 11 or 12 for girls and boys. The American Dermatological Association also recognizes the expanded age range, between 27 and 45, recently approved by the FDA for male and female HPV vaccination with human papillomavirus 9-valent vaccine. HintMD's patent-pending software allows physicians to turn any treatment plan into a monthly subscription payment for their patients. Skincare subscriptions allow physicians to offer professional-grade products delivered directly to the patient's door, at no cost. Patients can control the delivery frequency using the app, to truly personalize their aesthetic journey. HintMD is launching skincare subscriptions with physician dispensed Alastin Skincare. Ortho Dermatologics will soon begin distribution of Bryhali (halobetsasol propionate) Lotion, 0.01%, to U.S. wholesale pharmaceutical distributors.The Lotion, which is indicated for the topical treatment of plaque psoriasis in adult patients, is a new potent to superpotent corticosteroid in a novel vehicle lotion with safety established for dosing up to eight weeks. Top line results from Novan's Phase 2 clinical trial to evaluate topical nitric oxide product candidate SB206 for the treatment of molluscum contagiosum are promising. Data for three full cohorts of four show that SB206 gel demonstrated a clear treatment effect on the complete clearance of all molluscum lesions at week 12, with signs of efficacy evident as early as week 4 for the two highest doses, 8% and 12% twice-daily. The safety and tolerability profiles were favorable overall with no serious adverse events reported. Results for Cohort 4, SB206 12% once-daily, are targeted to be announced later this month. Based on the data generated in this Phase 2 trial, the Science and Technology Committee of Novan's Board of Directors has recommended that the Company proceed expeditiously, and by the end of the fourth quarter, with a request to the FDA for an end-of-Phase 2 meeting. This meeting would enable Novan and the FDA to agree on a Phase 3 development plan for molluscum. Following a successful end-of-Phase 2 meeting with the FDA, the company plans to initiate a Phase 3 program of SB206 for molluscum in the first half of 2019 with top line results possible by the end of 2019 or early in 2020. A novel 1060nm diode laser system is safe and effective for hair removal and long-term hair reduction in all skin types including darkly pigmented individuals, according to research in Lasers in Surgery and Medicine. Sixteen patients who were treated with the chilled sapphire tip (LightSheer Infinity 1060 nm ChillTip ET) showed a mean 68 percent, 82 percent, and 76 percent skin type-independent hair reduction in axillae, shin, and arm, respectively, at six-month follow-up visit as compared to baseline. Treatment with the large spot size vacuum-assisted handpiece (LightSheer Infinity 1060nm High Speed) was most effective in axillae and calves, with a 77.9 percent and 78.5 percent hair count reduction, respectively, at the six-month follow-up visit. Pain was minimal, and common post procedural responses included mild to moderate erythema and/or edema. Revance Therapeutics, Inc. is on track to submit a Biologics License Application (BLA) with the FDA for daxibotulinumtoxinA in the first half of 2019. The long-acting neuromodulator, also known as RT002, delivered positive top-line results in alleviating moderate to severe glabellar lines in the SAKURA 3 Phase 3 open-label, long-term safety study. As a component of the largest clinical program of an aesthetic neuromodulator, the SAKURA 3 study included nearly 2,700 patients and more than 3,800 treatments. Patients received up to three treatments of RT002 and were followed for over a year and a half. Overall, the safety findings were consistent with the known safety profiles for currently available neuromodulators in aesthetics. The rate of treatment-related adverse events decreased over successive treatments. For efficacy, based on investigator assessment, more than 95 percent of patients achieved a score of none or mild glabellar lines at maximum frown at Week 4 after each of three treatments. Measuring duration of effect, the median time to return to baseline glabellar line severity was 28 weeks. The median time to loss of none or mild wrinkle severity was 24 weeks. The SAKURA 3 results were consistent with those in the Phase 3 pivotal trials, SAKURA 1 and SAKURA 2. In light of these results, Revance says it will begin studies in 2019 in forehead and lateral canthal lines to explore the use and dosage of RT002 in the upper face. Global sales of neuromodulators totaled $4 billion in 2017 and are estimated to nearly double by 2025. Despite this, market penetration has remained below 10 percent for decades, at least in part because currently available short-acting neuromodulators do not address the number one desire of patients and physicians for longer-lasting results, Revance says. According to findings from a proprietary survey of more than 2,000 women aged 25-70 conducted on behalf of Revance by The Harris Poll, facial lines and wrinkles are the most concerning visible sign of aging among women in this age range. Still, only seven percent of women said they have used a neuromodulator in the past five years. In addition, the survey also included 246 dermatologists and plastic surgeons who see at least 15 patients a week who receive neuromodulator treatments. Among this group of physicians, 86 percent wish there was a neuromodulator that offered longer-lasting results than what is currently available. Revance also announced that it has entered into a license agreement with Shanghai Fosun Pharmaceutical Industrial Development Co., Ltd., a wholly-owned subsidiary of Shanghai Fosun Pharmaceutical Co., Ltd, providing Fosun Pharma Industrial with the exclusive rights to develop and commercialize RT002 in mainland China, Hong Kong and Macau. Fosun Pharma Industrial will be responsible for conducting necessary clinical studies, marketing and sales in the Territory, while Revance will be responsible for manufacturing drug substance and finished drug product for both the clinical and commercial activities in the Territory. There will be no transfer of intellectual property. Cutanea Life Sciences, Inc. has launched Xepi (ozenoxacin) Cream, 1% to treat impetigo in patients two months of age or older. Xepi is a non-fluorinated topical quinolone indicated for the treatment of impetigo due to Staphylococcus aureus and/or Streptococcus pyogenes. It is applied topically twice daily for five days. The availability by prescription of Xepi marks the first novel topical prescription treatment for impetigo in the last 10 years. Xepi has been shown to be active against most isolates of S. aureus (including methicillin-resistant isolates) and S. pyogenes, both in vitro and in clinical infections. In clinical trials, Xepi was found to be negligibly absorbed, safe, and well tolerated in pediatric and adult patients. CoolSculpting's Aesthetic Agency of Change panel featuring Ryan Olohan, the Managing Director of Healthcare at Google, and Catharine Meketa-Poirot, the Advertising Director at New Beauty magazine, offered doctor's tips on upping their online marketing game. Site speed matters, said Mr. Olohan. “If you don't want to lose leads, spend money on increasing your website speed.” Seconds make a big difference. Page speed is also a ranking factor on Google. One simple way to speed up website loading is by compressing images, he said. Whether plastic surgeon near me or laser hair removal near me, near me searchers will likely visit your practice within 24 hours. “You don't even need to type ‘near me' as Google knows where you are,” he said. When reviewing content on your site, consider adding content directed at brides, grooms and bridal parties. This would be a big win based on Google trends data, he said. Ms. Meketa-Poirot called on doctors to become ‘influencers' on social media. “The majority of those talking about aesthetics online have zero experience,” she said. Surgeons should establish themselves as the true influencers. This starts by posting on social media more frequently. Ms. Meketa-Poirot also gave the audience the low-down on trends spotted by New Beauty editors. “Body contouring is hot...and there is no end in sight,” she said. Other hot topics include cellulite, G-beauty or German beauty, which focuses on science and data coupled with wellness and dermarolling on the body for laxity. PIatelet-rich plasma (PRP) is among the hottest cosmetic procedures out there, but despite enthusiasm among the public and providers there hasn't been much research into its efficacy—until know. 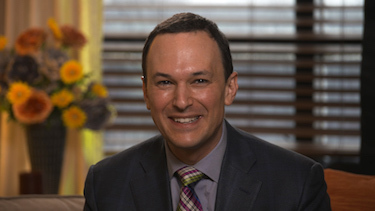 Murad Alam, MD, vice chair and professor of dermatology at Northwestern University Feinberg School of Medicine and a Northwestern Medicine in Chicago, shares details from his study in JAMA Dermatology on PRP for improving skin color and texture. 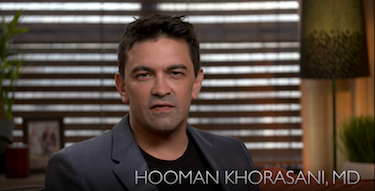 Dr. Alam: This topic is important to study because PRP is becoming an increasingly popular treatment for facial rejuvenation, but there is very little scientific evidence to show that it works, or what specific benefits it provides to patients. The treatment is attractive since it is natural, in that it uses a patient's own blood; it is minimally invasive, in that it doesn't require surgery; and it is relatively quick, and without much downtime. As scientists, however, we want to know whether it is actually effective at improving the skin color or texture. Dr. Alam: We enrolled 19 participants in our study. Each received injections of PRP to one side of their face, and of saline to the other side. Six months later, patients noted that the side with PRP was smoother, with less roughness and fine wrinkles. Dermatologist raters looking at photographs did not notice a difference between the two sides. This suggests that PRP may improve skin texture by a small amount after one treatment. It may have been easier for patients, who knew their faces well, to notice a small but real improvement. Dermatologist raters, who had to rely on photographs, may have been unable to see the change in texture, which does not always photograph well. Dr. Alam: The next step would be to perform additional studies to better understand the effectiveness of PRP for various treatments. Specifically, we plan to study the changes in the skin after several treatments of topical PRP combined with microneedling. We also want to learn how long the results of PRP may last. Finally, it would be interesting to see if future studies showed PRP to improve skin color and complexion, which our initial study did not. Newly released psoriatic arthritis (PsA) treatment guidelines from the National Psoriasis Foundation (NPF) and the American College of Rheumatology (ACR) are calling for a treat-to-target approach for all patients with active PsA. They also conditionally recommend use of tumor necrosis factor inhibitor (TNFi) biologics as a first-line therapy option in patients with active PsA and offer a strong recommendation for smoking avoidance/cessation. This is the first guideline that specifically recommends first trying TNFi biologics over oral small molecule (OSM) drugs. The guidelines also include recommendations for vaccinations, psoriatic spondylitis, predominant enthesitis, and treatment in the presence of inflammatory bowel disease, diabetes, or serious infections. The PsA guideline was developed using the Grading of Recommendations Assessment, Development and Evaluation methodology, which provides rigorous standards for judging the quality of the literature and assigns strengths to the recommendations largely based on the quality of the available evidence. Due to limited data in some areas, the quality of evidence was often graded low or very low. This led to nearly all recommendations being conditional. A voting panel of rheumatologists, dermatologists, health professionals, and patients achieved consensus on the direction and the strength of the recommendations.